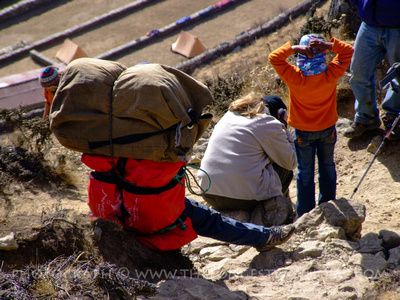 Worried about altitude sickness when trekking in Nepal? The following information is not intended to replace qualified medical advice. 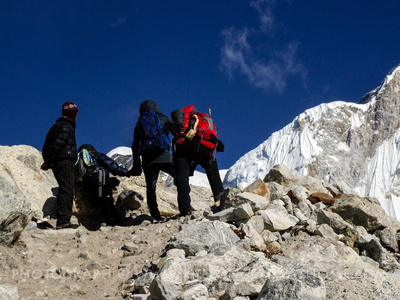 It is intended only to give you a rough guide & outlines about altitude sickness when trekking in Nepal. Please consult a qualified medical representative about your own needs before considering any activities at altitude. Altitude starts to effect us from 1,500 to 2,000 metres upwards. The higher we go on earth the lower the air pressure which means thinner air. This means with every breath you take the less oxygen there will be. We need oxygen to survive. Not only do our muscles need it but so do things like our brains and digestive systems. The higher we go the more our bodies adapt by breathing faster and deeper. Our bodies also start to produce more red blood cells to carry more oxygen. This takes time. If we move upwards into higher altitudes too quickly we start to suffer from oxygen depravation in the form of Acute Mountain Sickness (AMS), High Altitude Cerebral Oedema (HACE) or High Altitude Pulmonary Oedema (HAPE). All of which are potentially life threatening. Altitude sickness is a very real threat! Please understand that altitude sickness kills trekkers every year. It's very important you take this seriously. I get countless emails from people every year asking how they can cut a trek short to save money. Acclimatization days should not be removed to save money, they save lives! Ignoring altitude sickness will only give you a tiny note in a paper. Chinese trekker dies due to altitude sickness on Everest Base Camp trek. Read more about trekkers who go missing in Nepal and often die of altitude sickness or exposure. Many people throughout the world work at high altitudes. Their bodies have adjusted or acclimatized to the higher altitude over a long period of time. If trekking you may not have as long to acclimatize so it's very important to be aware of some of the symptoms surrounding high altitude trekking. Many people trekking will experience some form of AMS. The important thing to note is if the symptoms are getting worse? If they are getting worse then descending back 500m-1000m in altitude at sleeping level is recommended until acclimatization can occur. Treat these symptoms seriously. If a person exhibits the above and cannot perform routine tests like touching a finger to their nose with their eyes closed or simple arithmetic take action immediately. Do not leave a person with HACE symptoms unattended. Descend immediately (even in the middle of the night). Give cylinder oxygen or use a pressure bag if available (rarely found on treks in Nepal). Give dexamethasone or acetazolomide treatments if available. Descend!! People can die within one hour of developing these symptoms Descend to a lower altitude immediately. Treat these symptoms seriously. Is the person having difficulty catching their breath? Are they still breathless even when resting? Can you hear a wet or crackling sound from their chest (listen from their back between the shoulder blades)? If yes to any of these symptoms than take action immediately. Do not leave a person with HAPE symptoms unattended. Keep them upright. Descend immediately (even in the middle of the night). Give cylinder oxygen or use a pressure bag if available (rarely found on treks in Nepal). Give nifedipine or acetazolomide treatments if available. Descend!! A person can have AMS, HACE and HAPE all together or separately. Do be aware and take immediate action. Someone's life will depend upon it! Remember altitude sickness can take several or more than one form. Being prepared before you go trekking will help many of these symptoms from manifesting. However they are not a guarantee and you should always be aware of the symptoms and what to do should they arise. Do have a full medical check-up 6 months before embarking on a trek. Be sure to consult with a qualified medical practitioner about your individual needs when at altitude. Purchase any recommended medicines from a pharmacy your doctor recommends. If traveling with children be sure to take them to a doctor and remember to adjust emergency treatment medicine for their body size. Learn the symptoms of AMS, HACE & HAPE. Get fit before you travel at altitude. If you have heavy periods consult with your physician about iron supplements due to altitudes effect on red blood cells which carry iron. There might be an increase of blood clots due to some contraceptive pills. Please consult with your physician if taking contraceptive measures. Trekking at high altitude when pregnant is not recommended. If you have a pre-existing medical condition or are currently taking any medicine you should consult with your physician about trekking at high altitude. They will advise you in any side effects or alternative treatments you may need to take. Contact lens wearers might consider changing to glasses during high altitude treks. Reasons would include excess dust, grit and possible unsanitary conditions that may effect contact lenses. Prescription glasses and or goggles can be produced. Laser eye surgery patients may suffer from blurred vision at high altitude. It is not recommended to trek at high altitude if you've recently had laser treatment for your eyes. Arthritis and joint pain can be aggravated by high altitude. This is particularly true for the knees, hips and shoulder areas. Seek qualified medical advice about trekking in high altitude long before your departure date! Do not cut days from a trek for the sake of your budget. Purchasing comfortable warm sleeping bags & ear plugs for a good nights sleep if in shared accommodation. Consider a reduction or stop drinking coffee/alcohol in the weeks before moving to altitude. Get a proper water treatment solution agreed before trekking. Understand that you will be breathing heavily and more frequently in thinner drier air. This can lead to a blocked/runny nose, sore/dry throat. Which in turn can aggravate other conditions. Bring absorbent tissues or gloves with a rubber patch to wipe your nose. Creams/lip balm/zinc sun screen for protection of exposed lip/nose areas. People often suffer from ear infections due to a combination of altitude and/or climate changes. Take note and be sure to consult your medical practitioner beforehand for a solution. Do consider a porter for carrying your load if you are carrying too much or feel you are not capable in carrying all your belongings comfortably when on a trek. Make sure you have adequate travel insurance for high altitudes. Many travel insurance companies require notification or additional policies if you are going to high altitudes - be sure to consult with them. Drink plenty of fluids (water). Ascend slowly. Be prepared to urinate more throughout the day and night. Eat well and regularly. You will be needing more sleep, make sure to get it. Party after a trek, not during it. Wear adequate clothing for a trek. High altitude often means more exposure to the elements. Do wear proper warm clothing in layers. Be aware of wind prevention. Consider exposure to the sun with UV blocking cream and sunglasses. Keep your hands, feet and extremities as dry as possible. Avoid wet boots, socks, gloves or hats. Keep your hands as clean as possible during meal times to avoid contamination of food stuffs and possible stomach problems which can cause dehydration problems at altitude not to mention other issues. Keep a note of your urine and urination. You should be urinating more frequently than normal both due to altitude and from an increase in water consumption. Dark urine is one sign you are not drinking enough. Drink plenty of fluids! Make sure to understand the symptoms of AMS, HACE & HAPE not just for yourself but others around you. Important: Do remember to get travel insurance for Nepal before arriving and do make sure you are covered for trekking at an altitudes over the alitude you wil be reaching! Check out my recommendation for travel insurance for trekking in Nepal.